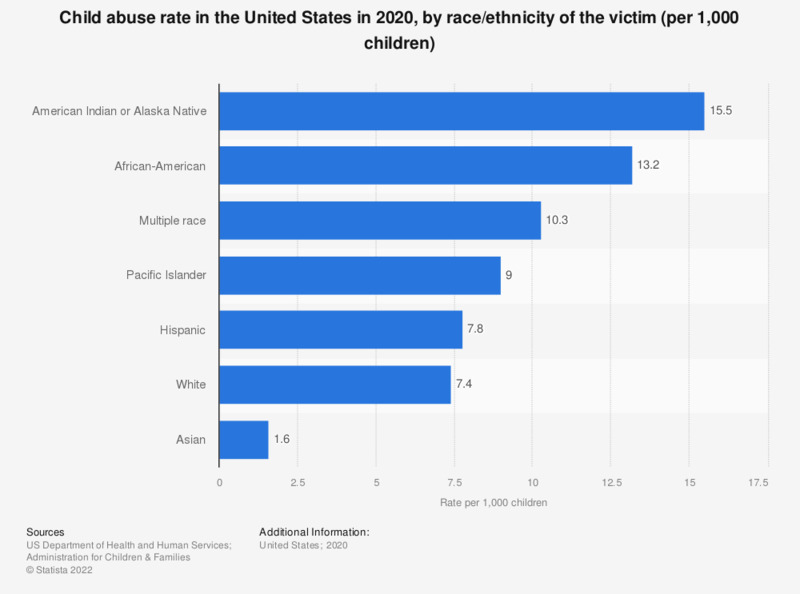 This statistic shows the child abuse rate in the U.S. in 2017, by race/ethnicity . In 2017, the child abuse rate for children of Hispanic origin was at 8.0, indicating 8 out of 1,000 Hispanic children in the U.S. suffered from some sort of abuse. The child abuse rate in the United States is highest among American Indian or Alaska Native victims with a rate of 14.3 cases per 1,000 children. It is most common among children between two to five years of age, with about 166,400 cases reported in 2017. Child abuse cases are fairly evenly distributed between girls and boys . However, more boys than girls were victims of abuse resulting in death. The most common type of maltreatment was neglect, with about 504,500 cases in the country, followed by physical abuse with 123,000. Child abuse is often reported by teachers, law enforcement officers, or social service providers. In the large majority of cases, the perpetrators of abuse were a parent of the victim. Risk factors, such as teen pregnancy, violent crime, and poverty that are associated with abuse and neglect have been found to be quite high in the United States in comparison to other countries.